Last year, Saban and his business partner bought Mercedes and Infiniti dealerships in Hoover, Ala., giving him additional insights into business challenges that his Atlanta audience faces daily. In his keynote address on the morning of Thursday, Feb. 11, he plans to offer his fellow car dealers leadership, motivational and team-building techniques to employ. 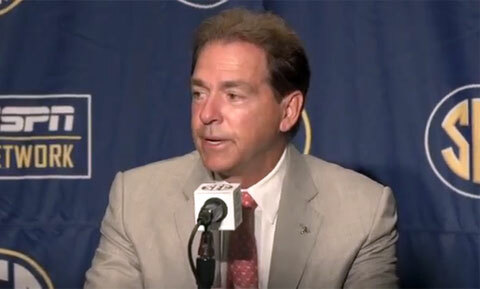 Saban is currently the head coach of the Alabama Crimson Tide. Saban took the Alabama position after coaching the Miami Dolphins for two years and previously coaching Alabama’s SEC Western division foe, LSU. A man of vision who has a proven record of championship success, University of Alabama head coach Nick Saban has brought to Alabama football a commitment to building the total program. His uncompromising dedication to excellence in every phase of the football program is sure to yield long-term success for the Crimson Tide. Saban has achieved resounding success as a head coach and has earned a reputation as an outstanding tactician, leader, organizer and motivator. Those qualities have sparked impressive turnarounds at every stop of his career. His teams have repeatedly exhibited grit, determination and resilience, often overcoming adversity to achieve victory. 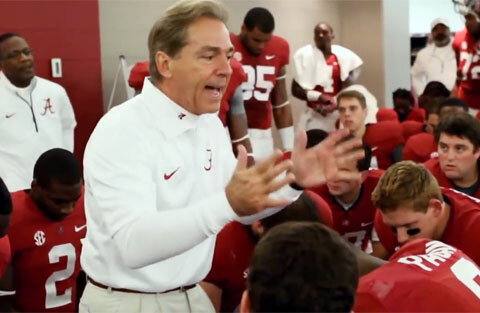 Saban’s consistent approach and disciplined leadership is a proven recipe for success. Saban is known as one of the most uncompromising leaders and masterful tacticians in either college or professional football. He is entering his ninth season as head coach of the Crimson Tide and led Alabama to national titles in 2009, 2011 and 2013. The six-time national college coach of the year also guided Louisiana State University to a title in 2003. Playing Field Promotions is a booking agent for motivational sports speakers and celebrities. If you would like to book motivational speakers, or coaches like Nick Saban for a speaking engagement, personal appearance or special event, you can request Nick Saban agent and speaker information from PFP Sports & Celebrity Talent or call 800.966.1380.